Holmpatrick Church of Ireland sits on the grounds of a monastery that was built in 1220. Before that date, the monastery was located on "Church Island", what is today believed to be St. Patrick Island, just off the coast of Skerries. Slowly the town Skerries grew around the monastery. During the Reformation Period of the 1500s, the monastery was dissolved and a Protestant church took its place. 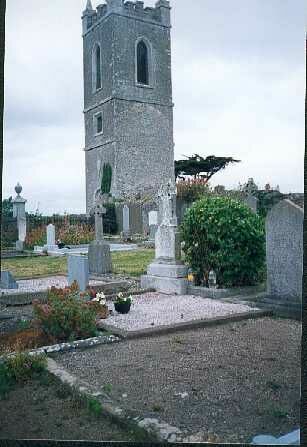 The tower you see in the photo is all that remains of the Protestant Church. The present-day Holmpatrick Church of Ireland building that now occupies this ground was built in 1867. This is not a complete listing of burials! The records below were provided by contributors to Cemetery Records Online.